← Are you sure what you saw happened? “I am proud to label myself a nonsmoker… diligently performing practices has profoundly helped me eliminate my troublesome craving…The conscious efforts I have made over the past month have helped me regain control of my life.” –L. F., a college student who became a non-smoker after smoking up to two packs a day since age 11. At 18 month follow-up L. F. is still a nonsmoker. “I have been struggling with eczema for most of my life and until I began this course, I was feeling very hopeless in managing this condition without the use of costly, and potentially dangerous drugs. My self-healing project proved to be empirically successful. My eczema shrunk in size from 72 mm in length and 63 mm in width as measured at baseline to 0 mm in length and 0 mm in width by the final day of this project.” –L. C., a college student who experienced recurring scaly skin patches since childhood. In our recent published paper, Transforming chained behaviors: Case studies of overcoming smoking, eczema and hair pulling (trichotillomania), we describe an approach by which students learn self-healing techniques which they practice as part of a semester long class project. After four weeks of of self-healing practices many of the students report significant decrease in symptoms and improvement of health as shown in Figure 1. Their success includes smoking cessation, eliminating hair pulling and eczema disappearing. Figure 1. 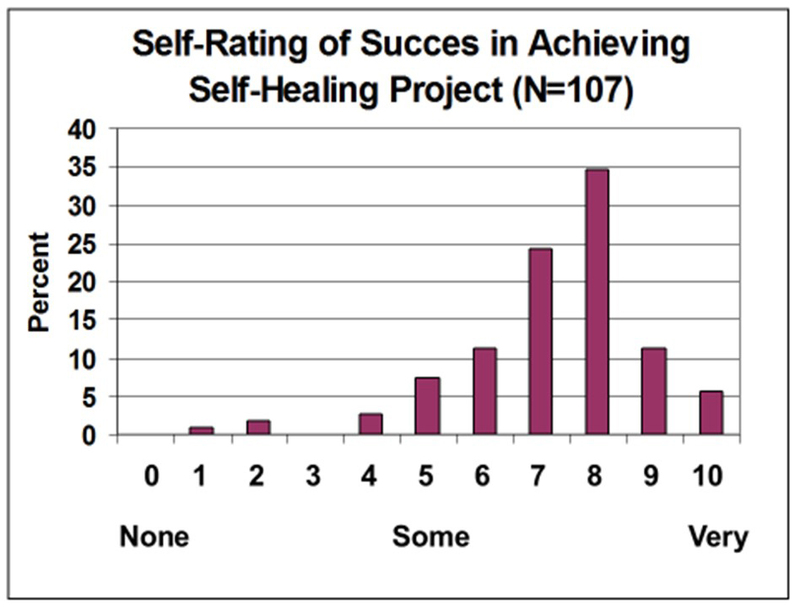 Students’ self-rating of success in achieving health benefits after four weeks of practice. One component of the self-healing process is interrupting chained behavior. We react automatically and respond instantly with sadness, anger, neck and shoulders tension, eating too much, veg’ing out watching videos, or playing mindless digital games. After a time, we may notice that we are smoking more, experiencing an upset stomach, back pain, headaches, high blood pressure, or even more skin eruptions. The first step is to sense the initial reaction that leads to the symptom development. Then, the person performs an alternative health promoting behavior and interrupts the chained behavior that triggers symptoms as shown in Figure 2. Figure 2. Interrupting and transforming the chained behavior. 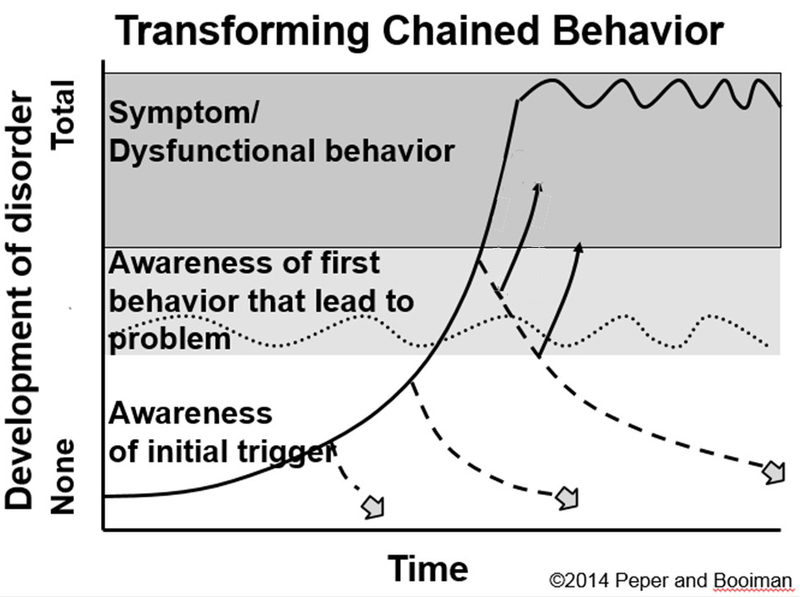 The moment person become aware of the trigger or behavior that is chained to the development of the symptom, he/she interrupts and performs an active new health promoting behavior as illustrated by the dashed lines. Chang your body position and smile while thinking, This will also pass. Practice a quick relaxation technique. Imagine a positive self-healing process. The longer the person waits to interrupt the chain, the more difficult it is to redirect the chained behavior. Awareness and immediate interruption appears to be major factors in achieving success. It means practicing the interruption and new behavior all day long. This is different from from practicing a skill for twenty minutes a day and the rest of the time performing the old dysfunctional behavior. Becoming aware of what is happening when the chain reactions. Learn a more functional alternative health behavior such as breathing, relaxing, focusing on empowering thought, eating other foods. Substitute the alternative behavior the moment you become aware of the triggered dysfunctional behavior. After having integrated this into daily life, many students report experiencing a significant reduction and even elimination of symptoms and behaviors. For background, specific techniques and successful case reports, read our published paper, Peper, E., Lin, I-M, Harvey, R., Gilbert, M., Gubbala, P., Ratkovich, A., & Fletcher, F. (2014). Transforming chained behaviors: Case studies of overcoming smoking, eczema and hair pulling (trichotillomania). Biofeedback, 42(4), 154-160. Thank you for sharing all these great posts! I love reading the stuff on your blog. It always gives me courage and hope to keep going on self-healing processes and simple meditations for everyday life!